Did President Donald Trump give his economic advisers an order that could smash the value of the U.S. dollar? And send the price of gold soaring? You bet he did, according to a new book by legendary Washington reporter Bob Woodward. In his new book on the Trump White House, Woodward reports that, early in his presidency, Trump discussed the national debt and economic stimulus with Gary Cohn, then-director of the National Economic Council. In other words, Trump saw the printing press as the solution to America’s debt problems. But what happens when you do that? When you just print money like crazy? Or rather, create the cash electronically with the snap of Trump’s fingers? We know what happened in Weimar Germany. Prices doubled every 15 hours, and people had to truck cash around in wheelbarrows to buy the most basic goods. 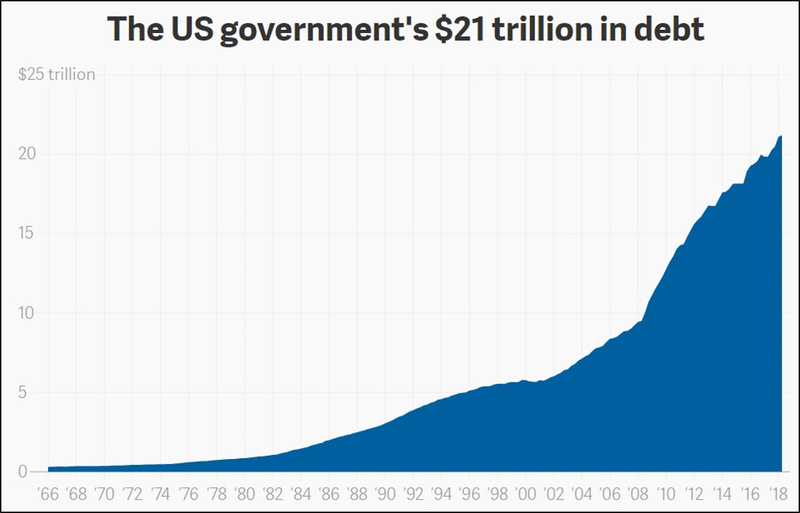 $21 trillion sounds like a lot. It is. And what’s more, the federal deficit, — or how much red ink the government runs up each year, to then add to the debt — just soared to $895 billion in just the first 11 months of fiscal 2018! That’s an increase of 32% … $222 billion … over the same period a year earlier. This is due to the massive tax cuts. They don’t feel massive to you and me, but big corporations and the top 1% should be writing President Trump “thank you” notes. An equally massive increase in defense spending also widens the gap. If we stay on this road, it’s only going to get worse. The non-partisan Congressional Budget Office says the deficit will hit $1.3 trillion (with a “T”!) by 2022. In other words, one out of every eight dollars collected in revenue will be needed to service the debt. Now, two things. First, as reported in Woodward’s book, Cohn pushed back hard on President Trump’s money-printing idea. However, I’ll point out that Cohn is no longer in the White House or holding public office. That’s one less person to tell President Trump “no” if he pushes ahead with his idea. And President Trump likes to get his way. Second, Cohn has publicly disavowed the quotes that Woodward attributes to him. But does that mean the entire thing is wrong, or Cohn thinks the verbal battle just used different words? Others are praising Woodward for his accuracy. Personally, I think some of this is beyond President Trump’s control. He can’t do anything about the War Cycle, which Martin Weiss and I have told you about. That’s ramping up. Global conflicts are going to get worse, not better. So, of course we’re going to spend more on defense. And as for the tax cuts, President Trump is just trying to jump-start the economy. And he’s having success. America’s GDP growth is projected to hit 4.4% in the third quarter. That would be the best quarterly growth since 2014! But that kind of stimulus is a “gain now, pain later.” Cohn emphasized that, longer-term, President Trump’s plan would hurt America’s fiscal and economic health, since printing vast amounts of money can trigger inflation. Back in the old days of the gold standard, the government could only issue as much currency as it held in gold. Then, in the 1970s, the U.S. went off the gold standard — and the value of the dollar has been on a one-way, hell-bound trip to the basement ever since. 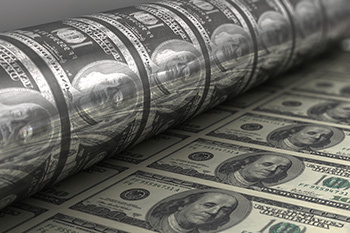 If President Trump does push ahead with printing money, it will only accelerate trends that are already in place. To Americans, it will appear that inflation is running rampant. And when that happens, you want to shift to assets that do well in inflation. Assets including gold. How do we know that still holds true today? Well, look at the example of another country that is slowly seeing the value of its currency erode. Though not as badly as Venezuela. I’m talking about Turkey. I showed you this chart in an article last month. Now, here’s an updated price of gold in Turkish Lira. The chart shows that the price of gold in Turkish lira is up 55% this year … and 133% since the start of 2016. You can bet that people in Turkey wished they bought gold back in 2016, before their current crisis reared its ugly head. The ironic thing is that, in the short-term, the U.S. dollar looks to get stronger. That’s because the U.S. economy is the envy of the world, and money is flowing here to escape troubles abroad. But eventually, those pigeons will come home to roost. As Martin Weiss and I have told you in our videos. Meanwhile, according to Woodward’s book, President Trump tried to crank open the printing presses once — and Director Cohn pushed back. This time, he isn’t there to stop it. Now, if President Trump gives the order to crank up the printing presses, look out! That’s when you’ll learn the value of gold. While I don’t easily dismiss the idea the President wants to print money, I treat everything Bob Wodward has to say with huge skepticism. He clearly has an axe to grind. You will inform us when the time is ripe to invest in gold and which ones. Is this correct? I put my Supercycle Investor subscribers in a new gold mining stock last week, and it’s up nicely. C’mon guys. A president, any president, could tell a “director of the National Economic Council” to print more money, but it has no impact or effect. A director of the National Economic Council does not control the Dept of Treasury. The Secretary of the Treasury could. The Secretary of the Treasury could order it (think Mnuchen), but Cohn could not. For all the effect it would have to tell Cohn, you might as well tell me to print more money. Fair point. But the President sets the tone of his administration. What fiscal tone do you think President Trump is setting? Your dislike of Trump is getting out of control. Please no more diatribes on Trump or using the published screeds to push a political agenda. I subscribed to Larry Edelson advice until I got dumped to Banyon Hill. Then I subscribed to your advice. Larry never lectured politics which made his advice creditable. You tangents into political rants degrades everything you write. Really reconsidering my subscription even if it is a lifetime subscription. Hi Terry, this article seems to view Trump’s recent comments favorable, as he indicated that he’d like to see the greenback weaken, as a weaker dollar tends to provide a lift to gold. Which would, in turn, mean a boost for gold stocks. If past is prologue, keep an eye on the Dollar Index and gold prices and see if the historical relationship holds up. I’m telling people about developments and how to make money on it. Whether you think it is good or bad is up to you. From the perspective of someone holding a lot of gold, this is positive. Gold is up since I wrote this story, and gold miners (as measured by the GDX) even more so. Good to see gold will soon go up instead of going down ! May all your investments go up, Russell. I’m expecting good things from many parts of the market this year.